Eat Your City: Grilled corn, chickpea and avocado salad with honey lime dressing - taste of summer! 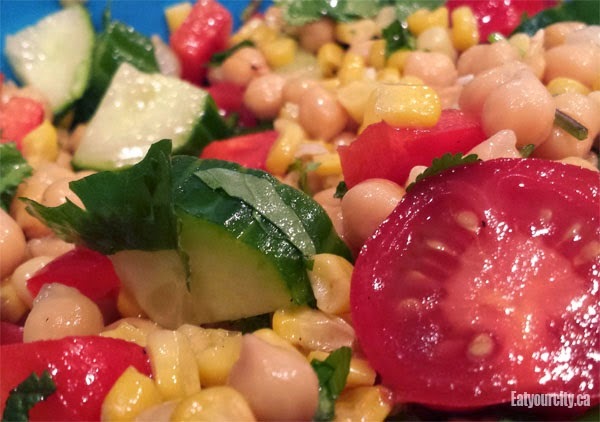 Grilled corn, chickpea and avocado salad with honey lime dressing - taste of summer! Think I'll be making this salad all summer! Its easy to toss together and once the flavours have a chance to get to know each other.. wow. Super delish and packed full of good stuff, this salad can be served as a side, pretty for a potluck and if you're feeling lazy, its a great quick lunch that is high in fibre, flavour and will keep you full.. and is just so. damn. tasty! I was lazy to fire up the grill, so I sprayed some tin foil with some olive oil, dumped a bunch of corn on to (frozen corn works too!) and stuck it under the broiler of the oven (stirring a few times) until the corn was cooked through and a little roasty looking (about 5-7 min). If you're grilling the corn, shuck all but the last layer of the leaves covering the corn, dip in water and BBQ them babies up for 10-15 min, turning every 5min. The exterior leaves will char and protect the niblets inside - cool, then de-corn the corn for the recipe. The recipe is versatile in that if you're missing an ingredient or want to add in extra stuff, go nuts. I didn't actually have a nice ripened avocado when I took pics so if you're wondering where my avocado was… it was sitting pretty on my counter getting ripened. 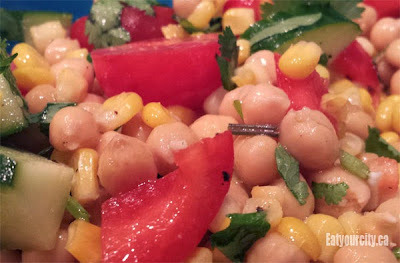 Grilled corn, chickpea and avocado salad with honey lime dressing - makes 8-10 side salads or 4-6 entree sized ones. 1) In a small bowl, combine all the dressing ingredients except for the fresh herbs. If using avocado, toss them into the dressing and coat well so it doesn't darken. 2) Add all the remaining ingredients, mix well, season to taste and pop in the fridge for at least an hour for the flavours to get happy happy. Enjoy!